This Is the Place Heritage Park was a surprisingly fun place to go with my kids. 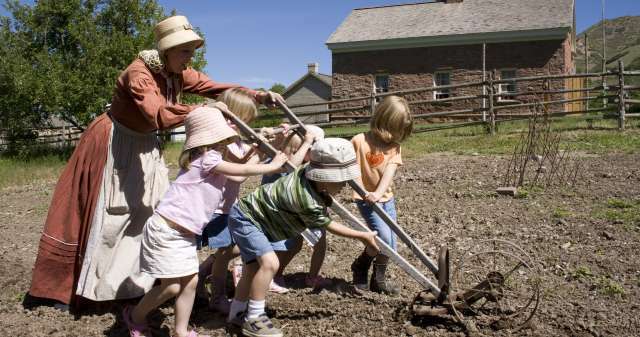 It&apos;s very interactive, is run smoothly and now is one of my favorite Utah attractions! I ended up going because we were having a family reunion at the park, and the wood shop/iron shop they feature was run by an ancestor of mine. It was really a neat experience to go into the shop and see some of his old tools. It was a blast to the past and the employees that were "running" the shop were really great at explaining things and making us feel like we were really in that time era. We loved riding their replica trains, walking through the old time general store and taking a horse drawn wagon ride. Learning about all the different shops was just so interesting to my kids! They learned something new at the post office, school house and everywhere they went. And there were great interactive activities for them to do with employees who loved their job. Learning how you sent a letter back then, playing old time kid games, washing clothing by hand, learning how they would farm and even giving a "shave" at the barber were some of the things my kids experienced! I now really enjoy going each season because it has a whole new "feel" during the winter, fall, summer and spring. And there are different special events during each season as well. For instance, I can&apos;t wait to take the kids to Baby Animal Days in May so we can meet all the baby animals and learn more about them.